Lay out the two tubes of crescent pastry, thick sides in. Use some of the left over crescent rolls to make the center a bit thicker. Follow cook time on the pack of crescent rolls. 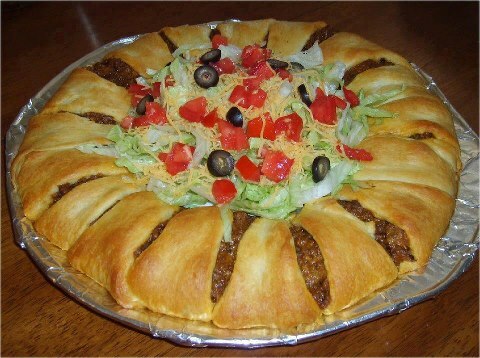 After it’s done, add cheese, lettuce, tomato, black olives, sour cream or whatever you desire for your tacos, in the middle. On a large serving plate spread bean dip. Mash avocados and mix well with lemon juice, and salt & pepper. Spread over bean dip. Combine sour cream, mayonnaise and taco seasoning. Mix well. Spread over avocados. Layer tomatoes, onions, olives and cheese. Serve with chips. May be covered and refrigerated for later use!